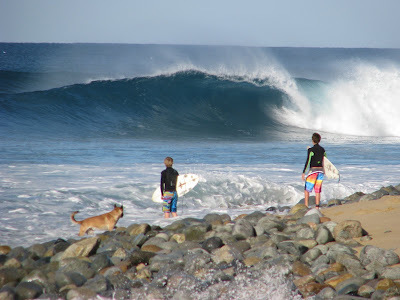 Stand Up Paddle Surfing: Southern Baja: A few more photos... some good ones! Southern Baja: A few more photos... some good ones! Photo: My favorite shot from today.... even the dog's checking out that grinder. Photo: Josh pulling in... charging! Photo: A few more sequence shots from today- swooping and flying. Photo: Such a fun wave, wait 'til you see the video clips from this session- some pretty cool stuff that I'm going to cobble together once I get back home. Photo: Mark W., smacking it! Thats it John Boy! I'm goin next year so you will have your own personal photog for the entire trip. I will bring the big gun and all the water cam stuff. I need that helmet for the GoPro HD!!! Rad. But, you better start seriously swimming- when it's even head high here it's got some PUSH! I'm going to hold you to your claim big guy. You'd love it down here- you'll also see lots of stuff you'd want to shoot, to eat. Im in and I will be ready! Yeah I bet there is some nice Venados walkin out in the back country! To bad it takes an act of congress to hunt down there not to mention BIG BUCKS! !